I am always endeavoring to take care of this body that has been given to me by eating healthy and thinking organic, sometime I fail miserably and sometime I ace the test, the struggle is not always trying to opt for salad vs’ mac n’ cheese, but locating a healthy item that makes me ecstatic that I chose it. 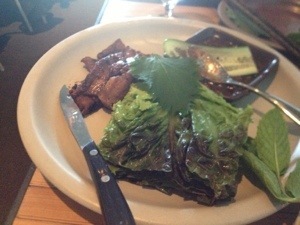 “The Slanted Door” San Francisco made great attempts to bend my thinking regarding healthy and delicious and a home run is what was achieved here with the “mesquite grilled prather ranch pork belly, with red leaf lettuce, mint, cucumber, and tamarind sauce. When all of these components are wrapped in the lettuce it produced an absolute combustion of flavors; the fruitiness of the tamarind, the coolness and crunch of the cucumber, and the mint which provided a refreshing backdrop on my palate was an extraordinary marriage made in food heaven. Now no normal person thinks pork belly is healthy, but when cooked & seasoned correctly with some of the fat cut off, you have a semi-lean meat that resembles an alpha male on the food chain. 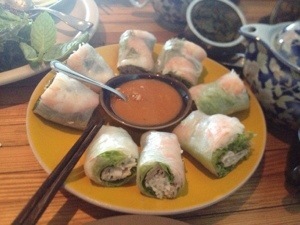 Sometime restaurants tend to create a signature dish and I feel that if a chef goes out of their way to show their clientele where they believe they shine, I would be remiss if I did not experience it, so it is “the slanted door spring rolls,” with gulf shrimp, pork, mint, & peanut sauce that was up next on deck. After the first bite I realized a few things, this roll significantly lacked sapidity, second the chef must have been slightly inebriated when naming this a signature dish, and third in one fell swoop I was back at square one, eating a healthy dish that tasted healthy, and to be frank no one feels titillated by this concept. Now one would think that I the eternal optimistic would view having one great dish and the other dish falling in the bland category still equals a good dining experience, but it doesn’t. What it does equal is a fair dining experience, and fair is the same as not memorable, not remarkable, and not impressive. But this doesn’t have to be so for the “The Slanted Door” a quick fix can turn this entire situation around, just simply make the “mesquite grilled prather ranch pork belly” the signature dish and all will be well with world and that distinguishable status that is clearly achievable can be easily attained. 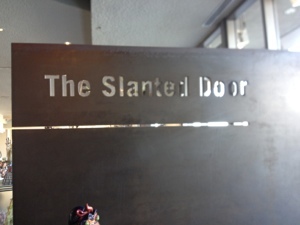 the ‘Slanted Door’ when in San Fran!!! !